What is a Jumping Spider? One of the creepiest things about a spider is that they scuttle around on eight legs and seem to be able to get into any crevice in your house, but if you have ever come in contact with a jumping spider you have probably experienced the sensation akin to panic that these bounding arachnids impose. If it’s not creepy enough that these spiders jump, they also happen to look like something out of a science fiction movie. Add to that the fact that this family of spiders is the biggest among spider species, making up about 13% of them, and you may begin to get a little…jumpy. Aside from the fact that jumping spiders jump, their most distinguishing characteristic is their eye pattern. Jumping spiders have four pairs of eyes with the anterior median pair being very large. This gives jumping spiders an excellent sense of vision. 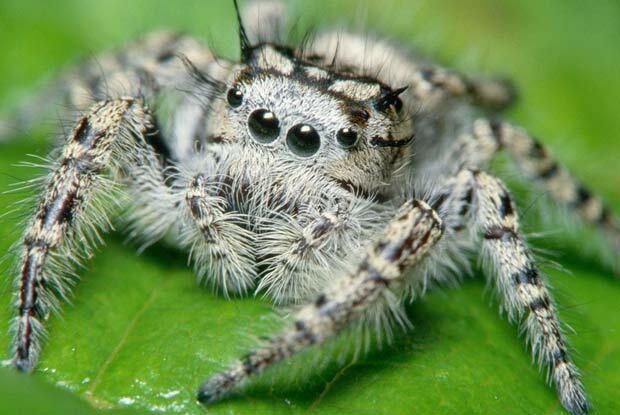 Jumping spiders are typically smaller than 0.8 inches, with females larger than males. These are some of the most brightly colored and interestingly marked spiders that exist. They have stout bodies, short legs, and the characteristically large eyes in the front of their head. Because the jumping spider jumps, it is tempting to envision that it is a dangerous species of spider. In reality, the jumping spider is neither poisonous nor aggressive to humans. Like other spiders, the jumping spider will not “attack” humans or animals, but may bite in the case of a stressful situation. If a human or animal approaches a female’s egg sac or the spider is squeezed against a human’s skin it may bite protectively. The bite of a jumping spider is harmless unless the victim has an allergy to the spider’s venom. In this case, it is very important to seek medical attention to have the spider positively identified and the bite properly treated. If a jumping spider bite does exhibit symptoms, they may include minor swelling, redness, and itchiness. Apply ice to the bite and keep the area elevated but below the heart.